I've always said that I would marry the first man who could make me creamy, rich scrambled eggs. They require more than just cracking and stirring -- not much more, but, well, I'm still single. Start with a nonstick pan. That glossy surface is essential to glide the eggs around. Secondly, use fresh eggs. Always break your eggs into a bowl, not straight into the pan! Whisk them with some milk or cream to make them nice and custardy. For richness and flavor use butter, never oil. 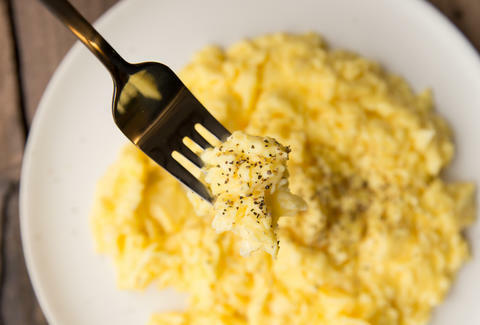 Use a silicone spatula for smooth scrambling -- and also because you should never use metal utensils on nonstick coating. Keep the flame low because you don't want to overcook the eggs. And, for the same reason, get them out of the pan before they're completely done because they'll continue to cook even as you gobble them down. Got it? My ring size is #6. Whisk eggs with milk, 1 pinch of salt, and 1 grind of black pepper until light and foamy. Melt butter in a large nonstick skillet over medium heat. When the butter foams, pour eggs into the middle of the pan. With a silicone spatula, slowly push the eggs back and forth, letting the liquid run around the pan until big, soft lumps form. Reduce the heat to low and fold curds over on themselves as you stir. As soon as no more liquid is visible (eggs should still look slightly wet), turn off the heat and immediately transfer eggs to a warm plate.